Friends don’t let friends come out alone. That’s the tagline to this movie, and it’s all about friendship. Synopsis: Adam is about to turn 24, and is also about to come out to his friends. Although it’s not a smooth process, his friends obviously care about him and try to cheer up their friend. Chris, Adam’s best friend, rallies the others to make more of an effort despite the learning curve and awkward moments. Poker nights and hockey nights were a little awkward for awhile, but once they all make it to the gay bar the fun begins. But when a misunderstanding happens will the friendships survive? Coming out stories in LGBT film have been around for many years now. At one point they were revolutionary, but as LGBT issues have become mainstream so have coming out stories. In a way. The thing about coming out stories is that they can go so many different ways. This film focuses on one, unique way that it happens to Adam. One of the good parts of the film is it’s overall humor. 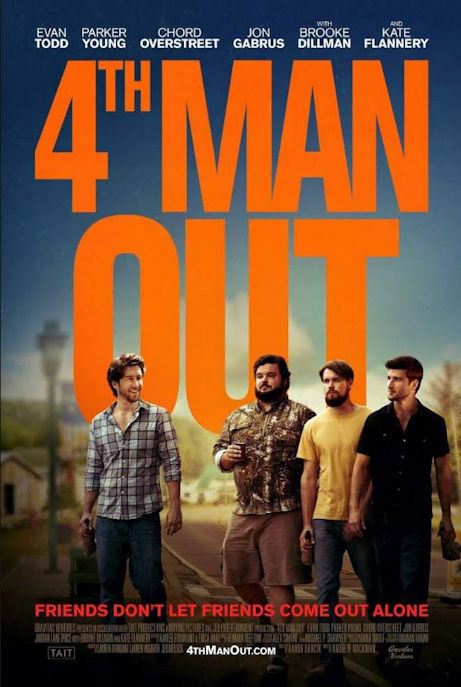 Coming out can be funny, and 4th Man Out capitalizes on it repeatedly. Coming out to parents using a sausage is one the more unique ways… Despite a few scenes that scream “Bring on the stereotypes,” the friends’ lack of awareness gives us some laughable lines. The good comedic timing helps and these guys seemed like naturals. But what is probably most endearing is the friendship between Adam and Chris. They’re best friends, and they obviously care about one another. Chris tries (and succeeds) at keeping things real with Adam. The double date scene is one of the best examples of their chemistry. But Chris finds a limit that he has some difficulty with, and this is part of the unique coming out story arc that hasn’t been overused in LGBT film. There are plenty of other things going on here as well. We have the coming out to parents story, the commentary on the gay, dating world, and the neighbor who brings the Jesus cake. I liked the fact that these side stories were there and used to enhance the film – they didn’t take away from the main story or feel undeveloped. Acting, music, and production values were all very good and contributed to the film. This is a good, “feel good” movie because when its over, you just feel like someone is at the beginning of a good thing. And when you have friends that care about you, that can go a long way.